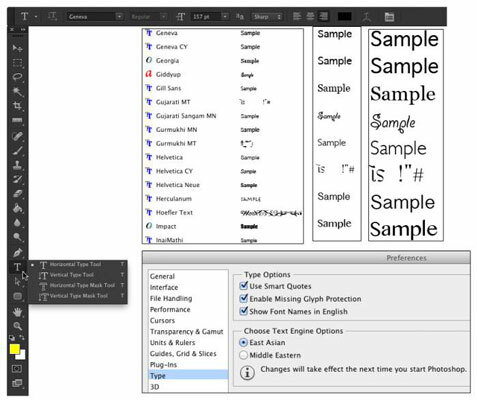 To control your basic work with text, Photoshop offers you four type tools, the Options bar, and several options in the Preferences dialog box, both in the Type section, visible in this figure, and in the Units & Rulers section. Photoshop also has a menu of type-related commands. As you can see in the figure, the Font menus in the Options bar can show a sample of the typeface (using the word Sample) when you click on it. You can activate the preview and choose from five different sizes for the font preview in the Type→Font Preview Size menu (shown are Small, Large, and Huge). In addition to the Type menu shown, you’ll also find four panels for more advanced work with text. 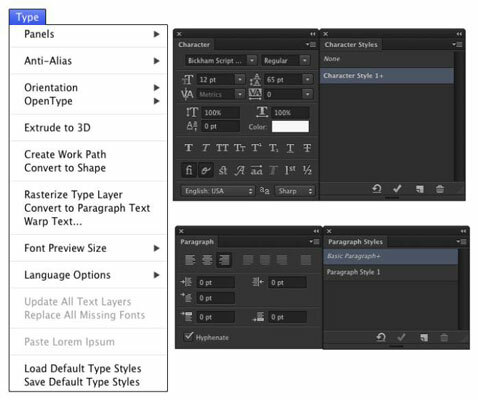 Along with the Character and Paragraph panels, Photoshop offers Character Styles and Paragraph Styles panels. By default, the panels are hidden because you can make the major type-related decisions (such as font style and alignment) right in the Options bar. You might need to show the panels if you’re doing some fine-tuning of the text appearance. When you need the panels, you can show them through the Type→Panels menu or Photoshop’s Window menu. Type can be informative or decorative or both. You can use the type tools to add paragraphs of text or a single character as an element of your artwork. The text can be plain and unadorned or elaborately dressed up with layer styles, such as drop shadows, glows, bevel effects, and other effects that you apply to make the layer content fancier. However you use it, text can be a powerful element of both communication and symbolism. Take a look at this figure, in which the Type tool is used to add the binary code to the left and even the musical notes below.